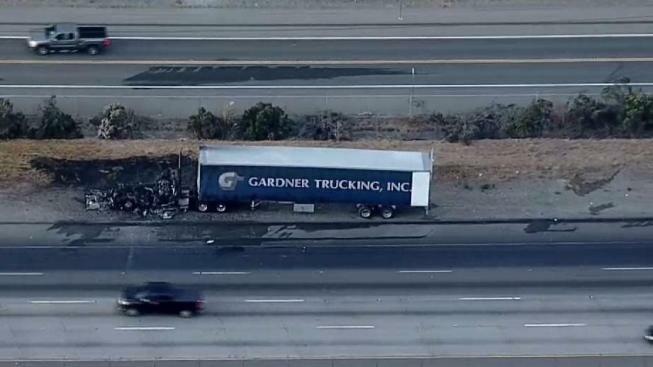 A big-rig fire temporarily blocked eastbound lanes of traffic along Interstate 580 near Castro Valley Wednesday morning, according to the California Highway Patrol. Mike Inouye reports. A big-rig fire temporarily blocked eastbound lanes of traffic along Interstate 580 near Castro Valley Wednesday morning, according to the California Highway Patrol. The blaze, which blocked lanes just east of Eden Canyon Road, was reported at 5:36 a.m., according to the CHP. A Sig-Alert was issued at 6:07 a.m. because at least three lanes were blocked, according to the CHP. Roughly one hour later, all lanes were cleared.